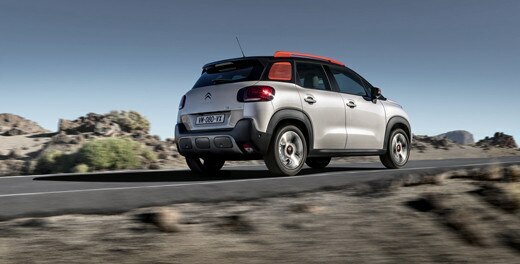 NEW CITROËN C3 AIRCROSS COMPACT SUV: 5 STARS IN THE Euro NCAP TEST! With its unique body styling and powerful and fresh attitude, the New C3 Aircross has already notched up more than 20,000 orders in Europe. Customers are attracted by its interior, featuring all of Citroën's unique know-how in terms of spaciousness, modular design and brightness. Boasting top-flight comfort and safety, the new model is equipped with 12 modern driver assistance systems and four connectivity technologies, and has now earned five stars in the Euro NCAP test. That achievement is synonymous with serenity for the occupants of the new urban SUV, equally at ease in the city and off the beaten track thanks to its Grip Control system with Hill Assist Descent. Launched earlier this month in Ireland, the New Citroën C3 Aircross has already notched up more than 20,000 orders in Europe. The new product offensive has proved successful in terms of sales, a result even more remarkable that C3 Aircross is still being launched on a majority of key markets, and has now been applauded for its excellent safety levels, with the C3 Aircross having added another string to its bow by earning five stars in the rigorous 2017 Euro NCAP protocol. The score confirms the numerous qualities and power of attraction of the true compact SUV model! The New Citroën C3 Aircross, which can comfortably accommodate up to five passengers with its 4.15 m body length, has confirmed its quality credentials by receiving the top star rating in the latest 2017 tests organised by Euro NCAP. The new model earned the five-star rating through strong performances in all categories, demonstrating the success of the C3 Aircross design from the standpoint of passive safety and pedestrian safety and its high level of driver assistance technologies. The rating, the points of which are detailed below, rewards the work achieved during the development of the New Citroën C3 Aircross compact SUV as well as its comprehensive offering of comfort and safety equipment. Designed as a true living space, warm and cheerful, the C3 Aircross is duty bound to offer a safe environment. At the wheel, the C3 Aircross demonstrates its SUV nature and excellent handling. The driver and passengers feel safe and enjoy top-level protection. A vehicle targeting young couples, young parents or grandparents, the New C3 Aircross compact SUV stands apart with its excellent child protection performance. Agile in the city but also boasting all-road skills for motoring adventures, the New Citroën C3 Aircross compact SUV fulfils the requirements of modern lifestyles and ensures impressive pedestrian protection. Informed by the Citroën Advanced Comfort® programme, the design of the New Citroën C3 Aircross compact SUV was conceived to make each journey easier and safer thanks to intuitive technologies ensuring peace of mind and safety at the wheel. The New Citroën C3 Aircross compact SUV features no fewer than 12 driver assistance and safety technologies useful in everyday use. Grip Control® with Hill Assist Descent (optional on Shine): ensures controlled grip on all types of road, and low speed even on sharp inclines. Active Safety Brake with a sound and visual alert: to reduce or avoid a risk of collision from ahead by braking automatically, instead of the driver having to break. The multi-purpose camera at the top of the windscreen detects stationary or moving obstacles and pedestrians crossing in front of the vehicle. From 5 to 85 km/h, the sensor activates the automatic braking when it detects a collision risk. From 5 to maximum speed, it activates a sound and visual alert when a risk of collision is detected. Colour head-up display: provides the driver with useful driving information in their field of view. Projected in colour on a retractable surface, this information (speed, guidelines of the cruise control and speed limiter, navigation indicator) is constantly available to the driver without them having to look away from the road. Speed-limit sign recognition with recommendation (standard): passes speed-limit sign information on to the driver via the instrument panel to record by himself the speed as a guide for the cruise control and speed limiter. Automatic headlight activation: makes night-driving safer by automatically activating high- and low-beam headlights depending on the lighting conditions and surrounding traffic. Top Rear Vision reversing camera: for extended vision and easier manoeuvres. When the driver shifts into reverse, the camera displays the rear view of the vehicle on the 7-inch touchscreen supplemented by colour reference points indicating proximity to any obstacles, as well as a reconstituted image showing a 180° view of the environment behind. Park Assist: makes manoeuvring calmer, easier, safer when parking. This system provides active assistance for parallel and perpendicular parking. On the driver’s request, it automatically detects a parking space then safely steers the car into it. The driver only has to reverse, accelerate, and brake. Lane Departure Warning System: fights lack of attention at the steering wheel when travelling at over 60 km/h. The system detects any accidental crossing of continuous or dotted white road lines without the indicator being used and warns the driver via a sound signal and visual alert on the instrument panel. Blind Spot Monitoring System: warns the driver that a vehicle is in their blind spot via a pictogram in the door mirror. Driver Attention Alert System: fights drowsiness, the system monitors the driver's behaviour via the multi-purpose camera at the top of the windscreen and warns the driver when their level of vigilance lowers. This system assesses the driver’s alertness by identifying trajectory anomalies in relation to road markings. The feature is especially suited to fast lanes, at over 65 km/h. Coffee Break Alert (standard): tells the driver when it is time to take a break after they have driven for two hours at speeds above 70 km/h. Keyless entry and start: for locking, unlocking and starting the vehicle without using the key. The car recognises drivers as they approach. Available from €20,695, the New Citroën C3 Aircross compact SUV is on show and available for a test drive across the entire Citroën Ireland Network.